How to organize small spaces seems to be a topic of great interest over on Pinterest. 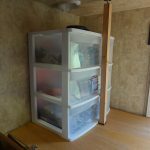 One of our top five posts here at TheTouringCamper.com is a post I wrote about camper cupboard organization. 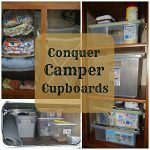 In that post I shared ideas for making the most of limited camper cupboards. 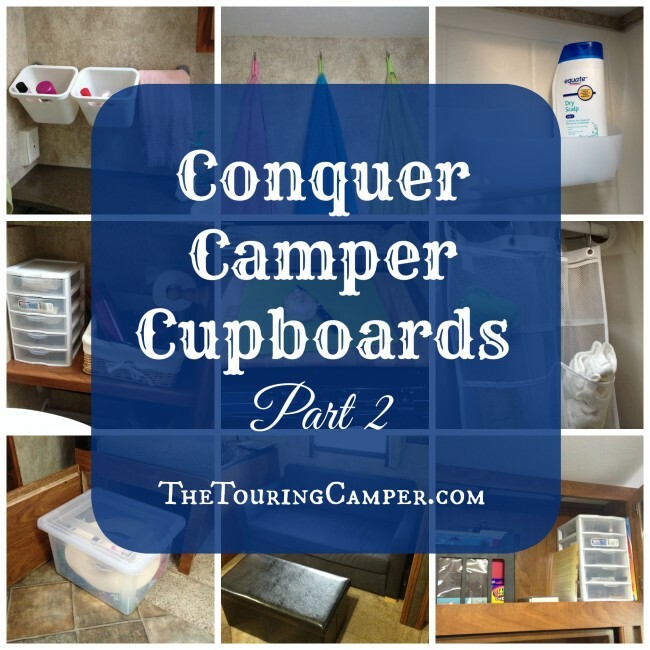 Since then, though, we’ve found some additional ideas and products to help keep the camper organized, so we thought it was time to follow up with Conquer Camper Cupboards Part 2! Note: This post contains affiliate links. When you make a purchase through one of the links, we receive a small commission at no additional charge to you. Thank you for supporting The Touring Camper! 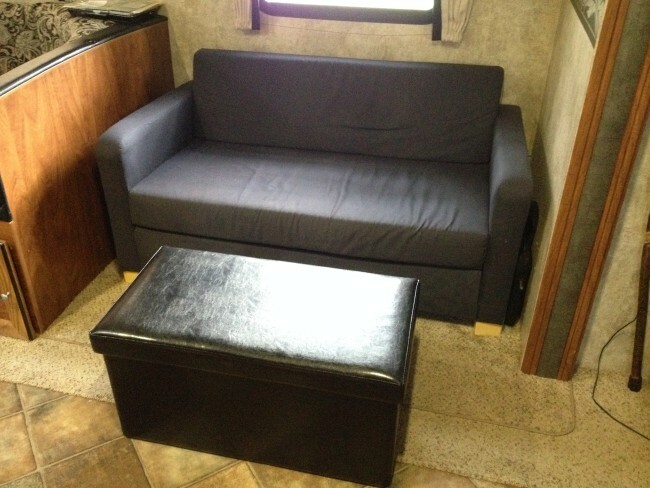 One of the best improvements we made to the camper over the past 12 months was taking out the factory-installed couch and replacing it with the Ikea Solsta sofa bed. Although it’s lower to the ground than the old couch, it is so much more comfortable! And if we ever need to use it as a bed, it folds out into a narrow double bed. 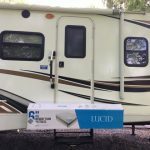 We also found a great storage ottoman at our local Ollies, which is great for stashing purses and other bags that typically clutter up our camper, but it also provides a nice place to prop up our feet. Finding products that serve dual purposes is key in small spaces! And if we ever need the ottoman out of the way, it folds up for easy storage. 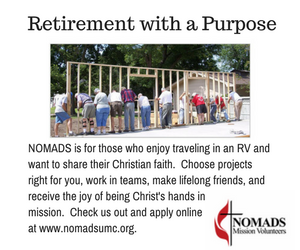 Many campers come with cupboards or drawers already installed on the dinette benches, but our model did not. 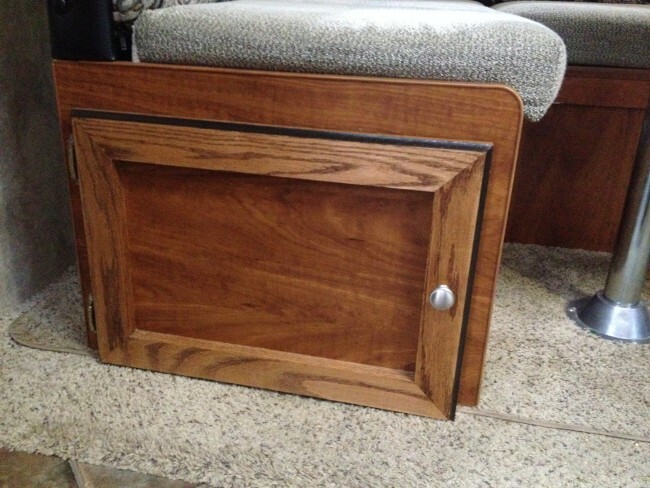 So our camping friend, who is a skilled woodworker, helped us add these beautiful doors to the area under our dinette. Now we can tap into all that extra storage space! For our West trip, we found that these file boxes fit perfectly underneath. We can get three of them lined up underneath one side if needed. These are the bins that the kiddos packed toys, books, and stuffed animals into for our three-week adventure. Then we added two shower organizers. On the shower wall we attached the 3M Command bath caddy . 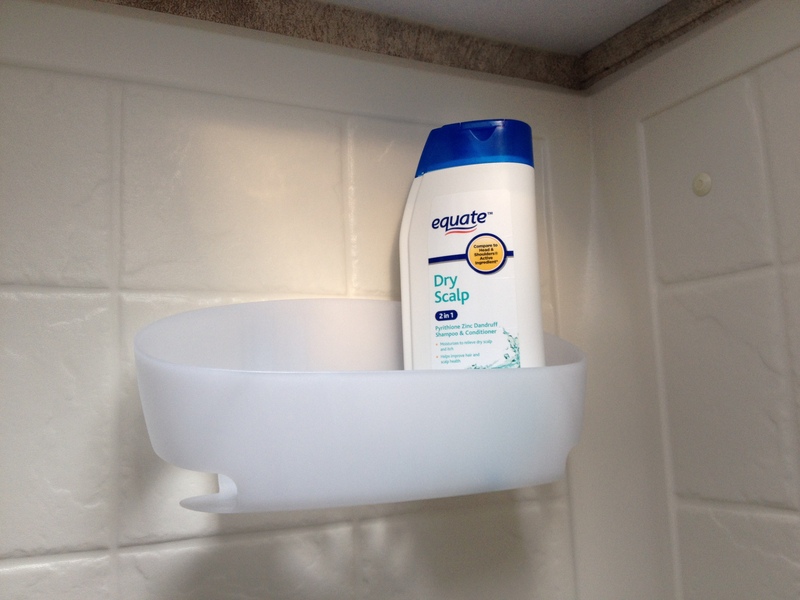 So far it is holding strong–even when we dropped in this hefty shampoo bottle. Some people have told us the adhesive weakens over the winter, so we’ll have to see how it fares, but it worked great this summer. 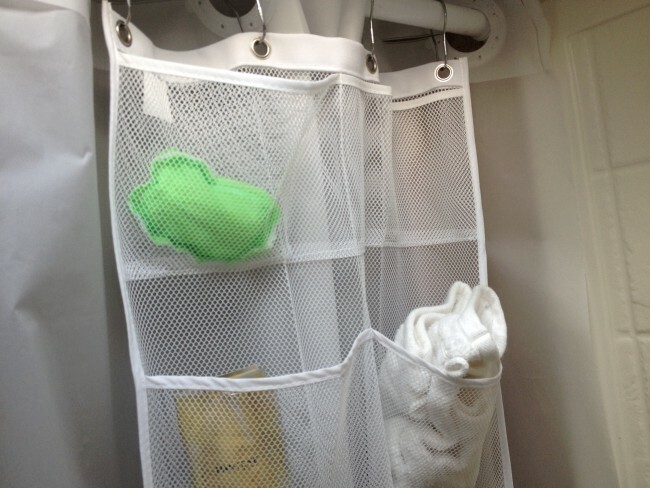 The other bath organizer hangs from the shower curtain rod hooks and we bought it off of Amazon. If it get soap scummy, this organizer can be washed. 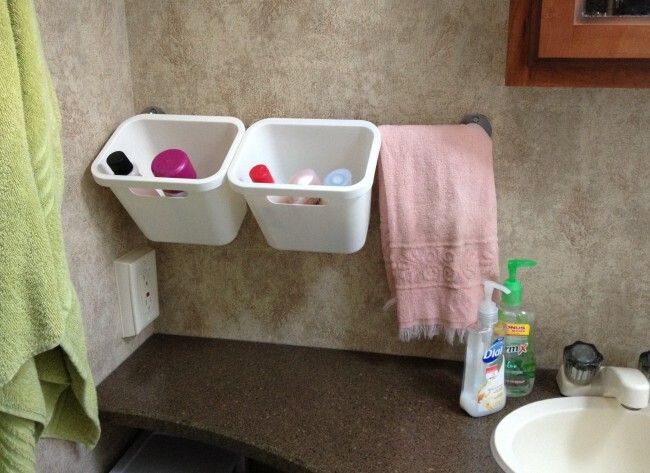 We found that the 3M Command strips also worked well to create additional towel hooks in the bathroom. 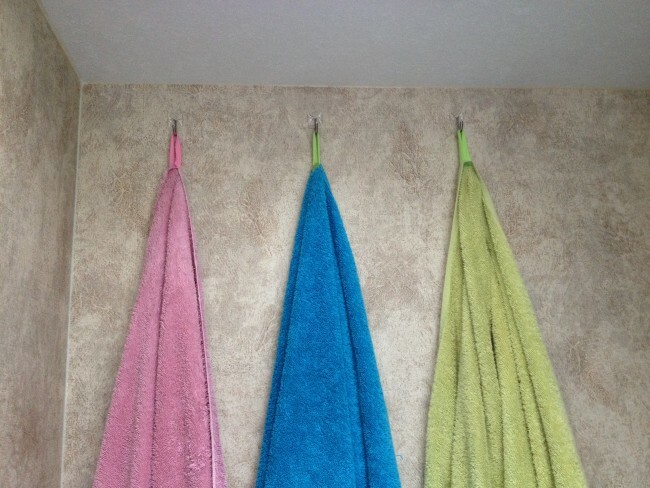 I sewed a loop on each kiddos’ towel so they could easily be hung on the hooks. In the cupboards above our TV the small Sterilite five-drawer organizer fit perfectly, too. So we put it to use organizing pens, pencils, rubberbands, stamps, and other office supplies for our West trip. A narrow hanging file bin fit on the other side of the cupboard so we could keep all of our campground information handy. Our camper stove did not come with one of those covers that creates a workspace when the stove is not in use. Since counter space is at a premium, we picked up a large wooden cutting board that covers most of the area. Although we have to stow it away in a cupboard when we are going down the road, it is easy to pull out to create instant counter space. 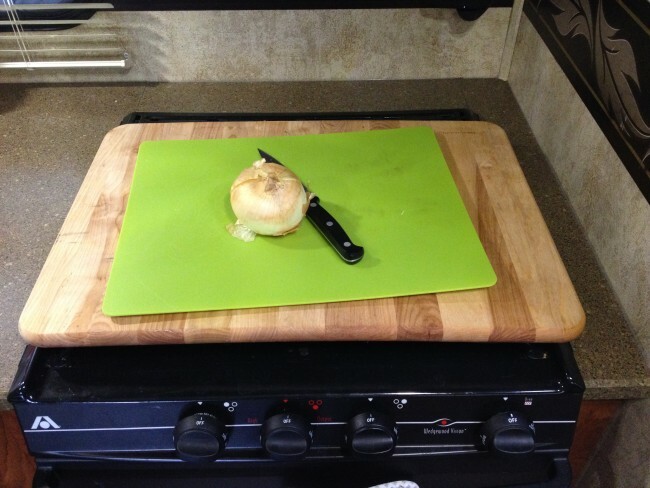 We also have a dish drying mat that we can put on top of the cutting board to create additional area to dry dishes. 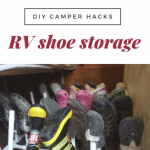 So that’s the roundup of all the new camper organization strategies we used this past summer. Things went really smoothly with two adults, three kiddos, and one large dog sharing the same space for three weeks, and I’m sure that’s partly due to having a great organizational system in the camper. What about you? 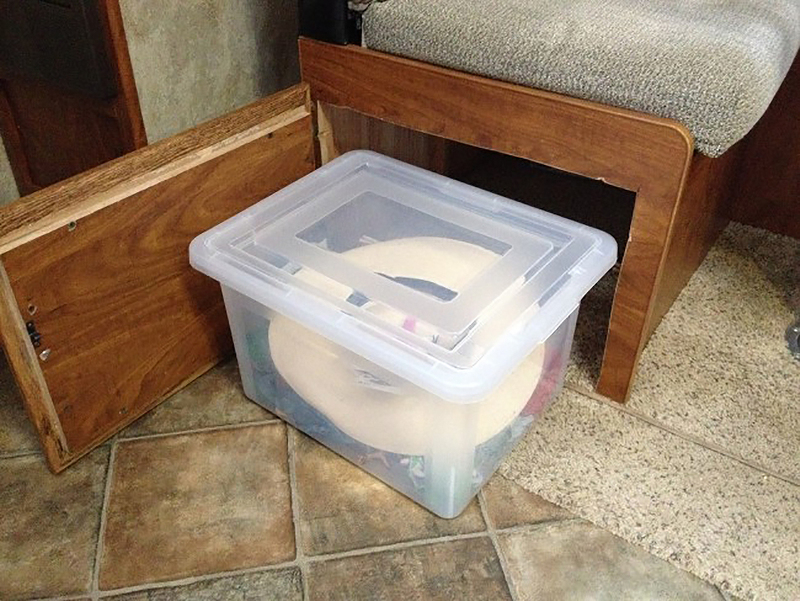 Do you have any camper organization ideas to share? If so, be sure to comment over on Facebook. I would love to know how to keep my cabinets closed during travel. We have magnets on some cabinets, child resistant laches on others and bungee cords on some. Very frustrating.. Any ideas? go to vintage camper supply and buy new latches that click in tight. Very easy to replace what you already have. Install tension curtain rods across the front of your cabinets just inside the doors. 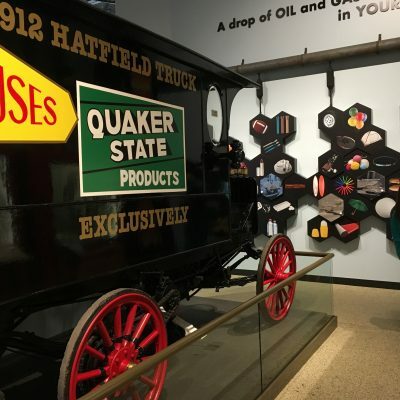 They will keep items from shifting and popping the doors open while you are in motion. When you get to your destination, pop out the curtain rods. They also work in the fridge. Hi Kathy–thanks for stopping by and sharing your great tip! Happy camping! I use velcro thru the handles…the ones over the couch and dinette don’t come open so I don’t worry about them. I have used tension rods inside the kitchen cupboard, but after a few trips and nothing moving in there I stopped using them. I still use them in my fridge. My cabinets with handles I tie shut with shoestrings. Works great! 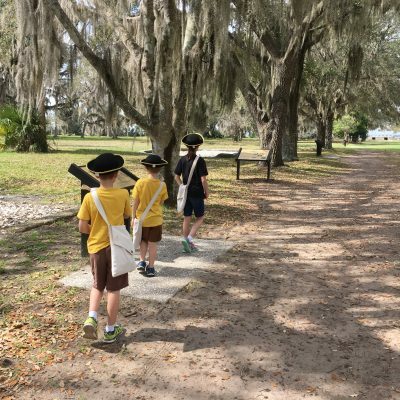 Hi Tami–thanks for stopping by and reading! That’s a great idea. We recently started using heavy duty twisty-ties to secure our one overhead cupboard that kept popping open and launching plates everywhere. Happy camping! I wrap small bungee cords around the handles. To hold dishes in place, and anything that might fall out and break when I open the cupboard, I put a travel pillow in the cupboard before shutting the door and putting the bungee cord on the handle. They work better than anything else I have tried—rods, etc. OrganizedObie.com has magnets. https://www.organizedobie.com/Magnets They have all kinds of magnets to keep drawers and cabinet doors closed. The cutting board on the stove is what my husband thought but we went and got FOAM drawer liner and a can of spray adhesive. Adhered the foam drawer liner to the back of the cutting board and it doesn’t sloop off wether we are cutting on it or traveling. It stays put! I just use the foam drawer liner and cut it the size of my cutting board and it stays put on my stove! My husband put heavy magnetic tape strips on the back of the wooden cutting board.and then attached to the top of the stove . Sticks very tightly and wont come off during travel. Hi Trudy! Thanks so much for stopping by and reading. That’s a great tip! Thanks for sharing. 🙂 Happy camping! I have a great coffee table that the lid comes up on hinges and becomes a table at the couch. It’s great for eating or any other things you need to do at a table. Just ran across this post on Pinterest. I also purchased a large cutting board to place on the stove. I have found it stores perfectly beside the sofa. One end has the folding step stool since I’m short, and the other has the cutting board and a TV tray that can be used for eating or extra space. Hi Janell–thanks for stopping by and reading! 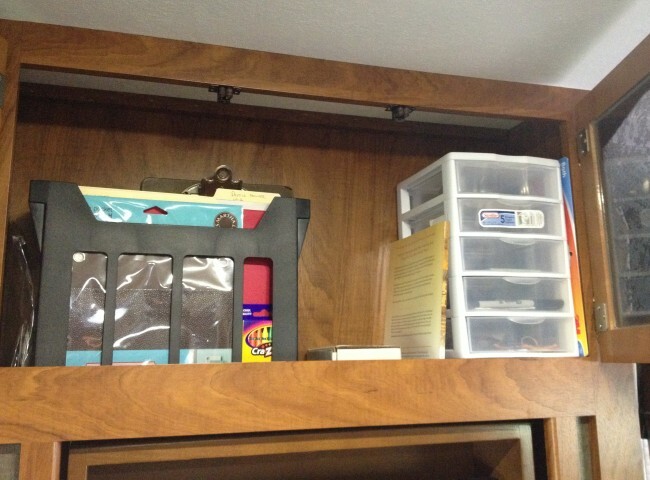 Those are great places to store the board and step stool–thanks for sharing your tips! Happy camping! Husband used a discarded pc of counter top cut to fit over stove and attached blocks for legs. Works great. We never cook inside anyway. Hi Jean! Thanks for stopping by and reading. And thanks for sharing the great tip! Happy camping! You just gave me a great idea. I will steal your idea only lengthen the legs then use the space under the board for attaching knives to the stove top with magnets. I would like help with keeping appliances/coffee maker on counter in our motor home as we go down the road. I hate having to always put my small appliances away every time we start traveling to a different place. Thank for any help you might offer. Hi Kathey! Thanks so much for stopping by and reading! That’s a great question. We also have to stow our coffee pot in a cupboard any time we are traveling between locations. I have heard some people experiment with the grippy shelf liner, but we have not personally tried it. Maybe some other readers can weigh in–and I will post your question on Facebook to see if anyone has suggestions. We have a Black n Decker under cabinet coffee maker which stays put during travel and doesnt take up counter space. 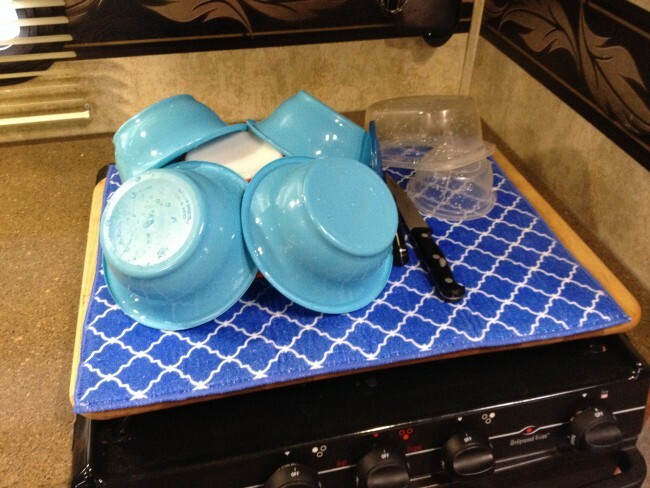 We use those shelf liners for our small appliances and other stuff that we want to keep on the countertop during travel. It works really great. Hi I use the grip liner under the coffee maker and just to make sure it doesn’t move I have bought the thin head bands and use one around the entire coffee maker plus I use a shower curtain clip through the elastic and attach to the trim behind the dinette seat. Works great and I can leave this appliance on the counter. I bought some of the blue “sticky-tac” (sold at the Dollar Tree) and put it on all 4 corners of the bottom of my coffee maker, my knife block, and my toaster oven (so much easier than the gas oven! )…stick it straight down to the counter! Nothing slides, and when we need to do a deep clean, it all comes up and can be reused. Last year I bought a silicone trivet/drain mat that is just a little bit bigger than my coffee pot and one for my toaster. The mats are heavy enough that they don’t slide like some of the rubber shelf liner stuff. They grip the counter really well and hold the appliances in place. I haven’t had either one move the slightest bit even when we were driving some really rough roads in rural Az and Utah. about your small appliances, we also have a couple that we leave on the counter. havn’t been on the move yet (due to truck issues) however this is the perfect time to get everything ready. O, Ya, small appliances. find the spot you want them to stay at and I have 2 ideas. (1) use Velcro on the base and mount it to the counter top. 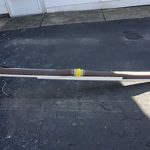 (2) drill a couple small holes in the wall insert anchors screw in a couple eye hooks and use a small bungee cord string or whatever to hold it against the wall. I have a small toaster oven that has a flat back I am going to Velcro against the wall and if you do not want to drill use command hooks. I literally made a cabinet and permanently mounted my Keurig 2.0 and Igloo Ice maker on sliding shelves. the are always plugged in and the door folds down to make a counter top / bar for drink preparations. slide them out for use and push them in when finished. I also have a locking latch on the fold down door / bar top for security while traveling not to mention the slide out when pulled in blocks access to the door and won’t let it fully open anyway. and the simplest way i guess would be to use non-slip drawer liners under appliances. I use them under my coffee maker and Ice maker permanently and have not had any issues in the last year. Of course apply common since, if you thing there will be a heat issue test it first. I utilized my coffee maker and Ice maker left on overnight, felt the bottoms for heat and to my surprise there wasn’t any, so i applied the non-slip drawer liners and checked every couple weeks to find everything OK.
Hi Gregg! Thanks so much for stopping by and reading! And thanks for sharing all the great tips! Happy camping! Any ideas for making items more readily accessible in the deep narrow pantry cupboard next to the fridge? I end up having to pull everything out to get to anything in the back. Help! Hi Jan–thanks for stopping by and reading! Great question. Would any narrow organizer bins work? Perhaps something like these refrigerator/freezer organizers: http://amzn.to/2sIur48. Another thought would be sliding baskets, like these: http://amzn.to/2sb63Hy. I’m not sure how wide the cupboard is, so would either of those fit? OrganizedObie.com has framed nets you can screw onto the wall. They stay flat and allow you to use space that is being wasted. https://www.organizedobie.com/Net-Pockets. Hope this helps! I put to use the celery savers Tupperware used to sell. Even the grid that goes in the bottom and the top can be pullout trays. Also, egg containers for fridges make great storage for cooking utensils and spice cans or bottles. Stored those over the cooktop. These items pop up at thrift stores frequently. Hi Debbie–thanks for sharing your great tips! I will have to check out those celery savers. Happy camping! I, too, used the cutting board on the stove with the dish drying mat on top. However, I found that the water from the dishes soaked through the mat and warped the cutting board! Our RV didn’t have a cover for the stove either, but we found one by Camco!! It’s metal and folds halfway to create a shelf. Check it out. It will definitely fit, since I have the same stove you do. I put my coffeemaker in the dishpan in my sink when traveling. I surround it with a dish towel to keep it from moving. 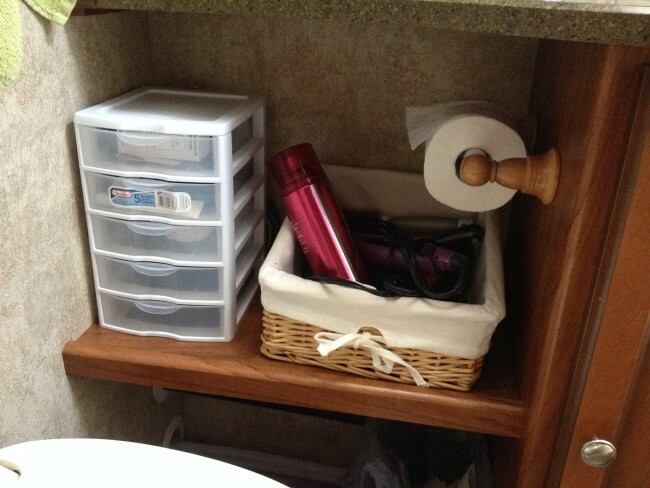 In my first trailer, I put the coffee maker in a cupboard and shoved a small travel pillow in front of it to hold it in place. Also, I use a large cutting board on my stove, but I stand it on its side under my sink where I store napkins and paper towels, which keep it from sliding while we are traveling.